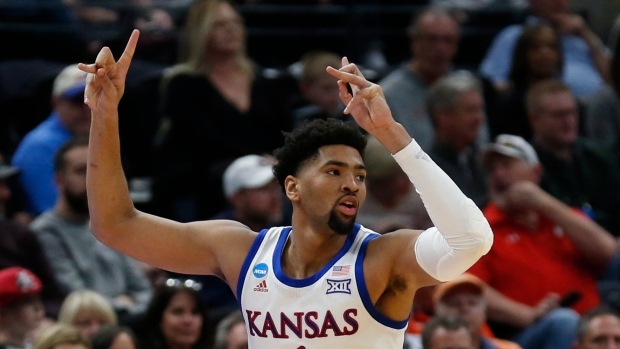 SALT LAKE CITY -- Dedric Lawson had 25 points and 11 rebounds, and Kansas dominated inside for an 87-53 rout over Northeastern on Thursday in the opening round of the Midwest Region. The Colonial Athletic Association champions went 6 for 28 from the arc after finishing the regular season 17th in Division I at 38.6 per cent. Sharpshooter Vasa Pusica had a hard time getting separation from the Jayhawks' athletic guards, finishing with seven points on 2-of-11 shooting. Jordan Roland had 12 points to lead the Huskies, who shot 28 per cent overall.